What Color is Mother of Pearl? Mother of pearl is the iridescent, inner lining of a mollusk shell, such as the pearl forming oyster or the abalone (ear shells). This is the same material (nacre) that forms a pearl. 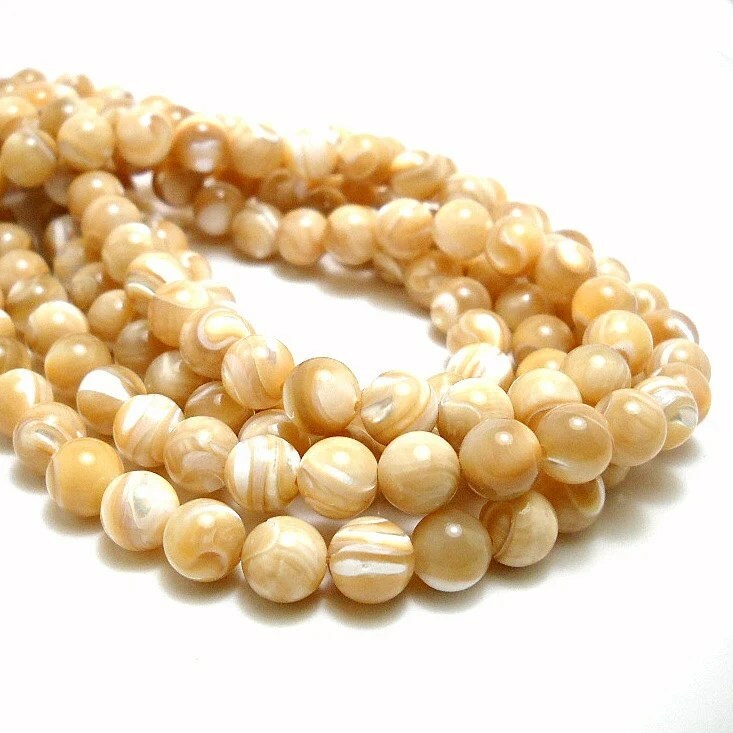 I’ve recently fallen in love with these natural mother of pearl beads in gorgeous alternating golden brown and white layers. But, I always thought that mother of pearl was always white. It turns out, that is not the case. Why does Mother of Pearl come in Different Colors? Mother of pearl comes in dramatic green, blue, and purple colors, as seen in the abalone. But, it can also form in more muted shades from golden brown to pink to white. The color of natural mother of pearl is a direct reflection of the mollusk that it came from. This can be affected by minerals in the water environment and the mollusk’s diet. As these factors change with the seasons, the color of the mother of pearl alternates, in bands like waves, as it is secreted by the shell. For example, in these beads you can see the golden brown layers are interrupted with pearlescent white layers. In modern times, mother of pearl is also dyed a wide variety of colors. And, conversely, it turns out that most of the bright white mother of pearl on the market is routinely bleached to obtain that desirable color. What’s your preference? No matter what color palette is your favorite, you can probably find a variety of mother of pearl, natural, dyed, or bleached, that fits your fancy. Hi Lynette,Love your Beads and Honey sight.My favourite is turquoise not only because blue is my favourite color but because it is a favourite of the North American Indians,which is a subject I follow. Thanks Rita! Turquoise is a wonderful stone, treasured, I think, all over the world. In fact, I was talking with someone the other day about the fact that it is also the most imitated semiprecious stone. So, it may be true that imitation is the highest form of flattery. I had no idea that mother of pearl could be found in so many different colors. This is great information, thank you so much for sharing. Thanks Bella! I think as a child I had some mother of pearl jewelry that was white. So, I always thought that was it. Who knew? Isn’t is great to learn something new about the things we enjoy!